When thinking about becoming a veterinary assistant there are a few things you may not know about the task or job that is being told. A veterinary assistant does get to deal with the animals and they do many tasks with the animals before the actual veterinarian sees the animal. This would be your task, to take care and administer medications prescribed by the veterinarian. So, what exactly are the duties of a veterinary assistant? We went into some detail in the introductory paragraph but there is so much more that is on your plate if you become a veterinary assistant. Your job is basically to take care of the animals. This can include a wide variety of duties around the veterinary clinic. When you undertake the profession of veterinary assistant you are also a very important role for patients and their owners. Most of the time you are the very first person they will see. You being kind and helpful is very important in this role. What duties does a veterinary assistant do? When becoming a veterinary assistant one major question you may ask is about the salary. Depending on where you live and where you plan to work, your salary will fluctuate. Some states pay higher than others for the same amount of schooling. Another factor that will affect your salary would be your schooling. The more schooling you have under your belt, the more money you will make. A national average salary for a veterinary assistant $23,899-$35,762. The median salary in the United States comes out to $29,648. If you fall into the 75th percentile you may be able to earn over $35,000 annually as a veterinary assistant. Read more about vet assistant salary. You will want to finish high school and obtain a diploma. This is the very first step to becoming a veterinary assistant. You may find it helpful to take biology, chemistry, as well as English to help you in your future as a veterinary assistant. Biology and Chemistry will expand your basic knowledge that you will use. As always, basic English skills are always important for any job that you may be interested in. Your second step will be earning a certificate. 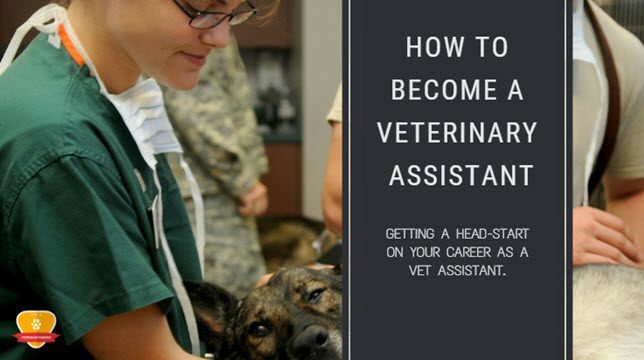 This is not necessarily needed but it will help you out extremely with becoming a veterinary assistant. Only 34% of veterinary assistants do not have a certificate. There are many 2-4-year programs in order to get your certificate so that you are qualified to be a veterinary assistant. During this program you learn what causes diseases, the diagnostic process, lab procedures, and treatment methods. These courses also help you learn animal anatomy, physiology, and parasitology. You will also learn veterinary terminology that can help you during future jobs. Once a certificate is obtained you are ready to go into the field and learn hands on. Once you have received a certificate and completed all your courses, you will want to look for an internship to participate in. You may get a paid internship or volunteer in an internship. If you are volunteering you will get the same experience as a paid internship. When you participate in an internship you will learn even more about the job itself and it makes you more certified in the field. You will be able to interact with many different animals as well as see how professionals take care and treat the animals. You will also get hands on experience during a volunteered or paid internship. The next step after an internship is to obtain a job in your field. You can find a job in quite a few places that would need your experience as a veterinary assistant. You can work at animal shelters, veterinary hospitals, zoos, and even local government agencies/labs. These are all places where you can take your college degree and get a job doing what you love. Lastly, you can advance your career. If you have a certificate you can put your credits that are already earned and look into a 2-year associates degree. If you are wanting to further your career you can even do a 4-year bachelor’s degree. This can help you move up and become a veterinary technician. Becoming a veterinary assistant is pretty simple. The education process is not that hard to follow. There are a few ways you can go about becoming a veterinary assistant. One way is simply graduating high school and looking for a job. This route may cause frustration and you may run into dead ends. Some places will accept a high school diploma but many jobs would like to see further schooling. As stated earlier only 34% of veterinary assistants only have their GED or high school diploma. You may want to go on to further schooling after high school to ensure you can find a job in the field. However, if you are thinking about becoming a veterinary assistant in high school there are some programs available. You may want to take courses that will help you later on with your career. Courses that you may want to take in high school include, office operations, communications, life/physical science, biology, and even English. These classes will help you in your job field. However, this is just basic information. You will want to continue these classes in college. Some high schools even offer veterinary assistant programs to give you basic knowledge and some beginner hands on experiences. This veterinary assistant program generally takes about a year to complete and you will receive a certificate stating you are certified. Even though you are certified in the veterinary assistant program, many places will want you to go onto college. Many jobs will want to see you being certified by the National Association of Veterinary Technicians in America. This is more reputable to employers and you can receive this certification in college while you are taking your courses. This course is being offered on 29 campuses around the United States as of right now. If your campus does not offer this program you do not need to sweat. Simply take many courses that teach the material that would be needed for becoming a veterinary assistant. This would include classes that would teach veterinary medical terminology, restraint and handling, surgical nursing and care, and lab and clinical procedures. These are all the things you will need to know when entering the field. When thinking about becoming a veterinary assistant you will want to think about what certifications and licenses you will need. Many places require certain licenses or certifications before you are able to work for them. Rarely will you be able to find a veterinary assistant job with a high school diploma. You will need to complete an associate or bachelor’s degree in college. These courses will revolve around scientific principles. You will want to take biology and other courses that will help your outlook on animal anatomy and physiology. Taking courses that help you in your field is essential. English, communications, and other classes that help you with desk work and interacting with others is also a great idea. This is a great idea since you will be working with people a lot. You are the first person that the patient and their owners will see. To obtain these licenses you will need to complete 2-4-years of college. You can do this or you can attend a one-year veterinary assistant program. This is offered at many high schools and public buildings. This is an easier certification to get. However, this certification may not qualify you for the job. Many places that would need a veterinary assistant want you to receive the veterinary assistant program certification through the National Association of Veterinary Technicians in America. This is more of a professional program to many employers. This course is offered at 29 colleges across the United States. You do not necessarily need to take the veterinary assistant certification program if you are going through college to achieve an associate or bachelor’s degree. The same applies to the associate or bachelor’s degree, you do not necessarily need to go to college if you pass the veterinary assistant certification program. So, before you start your path make sure it is what is right for you. However, if you do both schooling and the vet assistant program you are more qualified than a person who does one or the other. The outlook on becoming a veterinary assistant is looking great for those wanting to join this profession. The employment of veterinary assistants, animal caretakers, and laboratory workers is looking to grow 19% in the next 10 years. With many people having animals and these animals needing assistance there is an exponential expectance for the employment to rise within the next 10 years. There is a need for veterinary assistants in the field to help the veterinarians do their job. The employment considers those who are veterinary assistants, laboratory technicians that work with animals, and animal caretakers. These are all jobs that are going to see growth in the next 10 years. Read more about vet assistant jobs. Should You Become a Veterinary Assistant? A veterinary assistant has a very great job. Many veterinary assistants love their job and find it rewarding. A vet assistant has the opportunity to help animals that may not be able to help themselves and sometimes even save lives of animals. However, the most rewarding part according to veterinary assistants, is the happiness that they are able to provide to their patient’s owners when their animal is sick. Being able to help animals and people at the same time is a very rewarding experience according to many veterinary assistants. The average salary of a veterinary assistant is anywhere from $23,889-$35,762. This is an annual or yearly salary. Depending on your schooling you may make more or less. The more schooling you have completed, the more certified you are. The more certified you are the more money you are going to make. If you are wanting to make the most money possible, become as certified for your position as you can. Making sure you have all the certifications and licenses is a good way to earn more money. Your salary also depends on the state you work in. Some states pay more than others for the same job. The average household has at least two animals if not three or more. A veterinary assistant is going to need to help these animals. With many people owning more than one animal the job outlook for a veterinary assistant is looking up. The employment of veterinary assistants is looking to grow by 19% in the next 10 years. This is the fastest growing field for employment. This is because so many people are owning more and more animals every year. These animals need to come in to be taken care of and that is where a veterinary assistant comes in handy. Becoming a veterinary assistant can be a long process or it can be very short and simple. However, taking the shorter route may make you less qualified. Typically, most veterinary assistants take 2-4 years of college after obtaining a high school diploma. Many veterinary assistants obtain an associate or bachelor’s degree in their field. Many people also become certified by the National Association of Veterinary Technicians in America to make them more qualified for a job as a veterinary assistant. Physical Fitness: Being in good shape can help you move quickly and complete your tasks in a timely manner. Focus and Multitasking: Being able to multitask is important. You may be working on multiple animals at the same time. Being able to focus and remember which animal has what and needs what is extremely important. Interpersonal skills: You are dealing with a number of people and having good people skills is important. Love of Animals: If you are going to be in this field you are going to want to love animals and want to love to help them. Handle Stress: You are going to be put under stressful situations every now and then. You are going to need to be able to handle these situations with poise and be able to keep your cool. Good Temperament: You are going to be put in stressful situations that may cause you to become angered. You need to know how to process this anger in a positive way. Q. What do you do as a veterinary assistant? There are many duties to be performed as a veterinary assistant. Q. How many days does a veterinary assistant work? On average a veterinary assistant will work 25-40 hours a week. This is 3-5 days a week. However, you may be on call if you have an emergency happen that needs immediate attention. Q. How much does a veterinary assistant make an hour? The national average for the hourly wage of a veterinary assistant is $11.75 an hour. Again, this depends on your qualifications and what state you are working in. Q. What skills do you need to be a veterinary assistant? There are many skills you need to become a veterinary assistant. You are going to obviously have the knowledge behind the field but also personal skills. You will want to be able to multitask and focus, have a love of animals, have a good bill of health, be great with people, and have a great management of stress. These are all skills that will come in handy as a veterinary assistant. Q. What qualifications do you need to be a veterinary assistant? To become a veterinary assistant, you are going to need a few things to qualify for a job. You are going to need a high school diploma, an associate’s degree, and/or a certification from the National Association of Veterinary Technicians in America. You are also going to want to have some internship in your field before applying for a job. This will make you more qualified and more likely to obtain a job. Q. How long do you have to go to school to be a veterinary assistant? Most veterinary clinics require a person to obtain an associate’s degree in veterinary technology to obtain a job. This degree takes two years or less to complete.